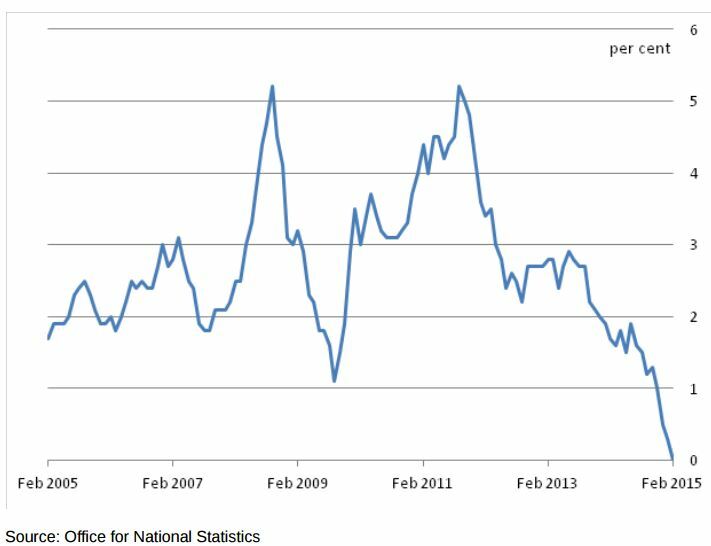 The ONS has released the inflation data (CPI) for February, which has fallen to zero. Governor of the BoE Mark Carney had warned markets that in the near term inflation would fall, but in 12 months pick up quickly. The latest release from the ONS is the lowest level for CPI since inflation estimates began in 1988. The ONS release highlighted the slowdown in inflation to price movements in recreational goods, food and furnishings. This reading was key for policy makers as the primary impact from the drop in energy prices should have been accounted for; however there should be a contributory effect as inputs trickle through to other goods. The BoE MPC remit is to target inflation at 2%, the latest record low reading is a significant argument against the bank starting to tighten monetary policy. The argument is that the risk of deflation is worse than that of inflation, however if policy isn’t normalised then what tools does the central bank have to target policy in the future? The rebound in house prices to beyond pre-recession levels (especially in London) has been cited as a major risk to the future stability of the economy. The global recession began with lending to sub-prime in the US and the globalisation of collateralised debt swept through the short term borrowing markets like a tidal wave. Analysts have cited the growing disparity between income and house prices with the impending increase in interest rates likely to put a squeeze on disposable income which could stall the recovery. The ONS release for January stated that the growth in prices had slowed to 8.4% in the year to January 2015, down from 9.8% for the 12 months to December 2014. On a month on month basis that can be more erratic, house prices fell 0.2% between December and January, however this is seasonal slowdown. The General Election is just 44 days away, and though the campaigning doesn’t rival House of Cards, it is in full swing. I don’t believe that the likely risk of a coalition government isn’t fully priced into Sterling. Recent polls have a marginal gain for Labour, however neither party will have enough seats to claim an outright majority. The uncertainty over the future direction of the UK economy, depending on which mesh of political parties hold power, should be unnerving to investors. The Conservative Party is seen the pro-business party, but their headline policy of a referendum over the UK’s membership of the European Union is seen as a major risk for future trade and migration of labour.